This huge packet of Editable Nautical Themed Classroom Decor will transform your classroom into a fun, inviting space! Looking for a new classroom decor theme to help brighten, organize, and beautify your classroom? 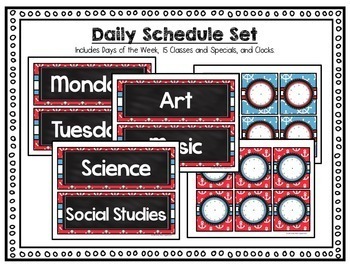 This set has everything you need, including a huge variety of editable templates for you to personalize your space! Click HERE to save 20% by purchasing this resource in the Nautical Classroom Bundle. Please check out the PREVIEW for a better look at all the pieces! What makes this set even more desirable is the fact that you can EDIT the templates to customize them to say exactly what you need! It's the best of both worlds: You get ready-made pieces all set to print AND templates to add your own lettering. Easy-to-follow directions for adding text are included. Don't worry if you've never used an editable product before; it really is as simple as adding a text box in this PowerPoint file. Click here to see a video on HOW TO USE MY EDITABLE FILES. 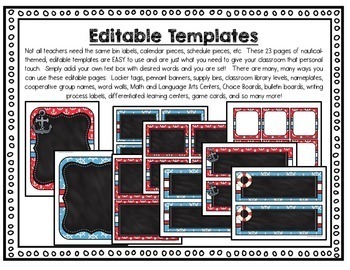 There are many, many ways you can use these editable pages: Locker tags, pennant banners, supply bins, classroom library levels, nameplates, cooperative group names, word walls, Math and Language Arts centers, Choice Boards, bulletin boards, Writing process labels, differentiated learning centers, game cards, and so many more! Add splashes of red, white, and blue, or other colors with accessories, such as paper lanterns or large tissue paper pom poms, throughout your classroom for a crisp, happy, colorful look! You will love the fun, inviting look of this nautical-themed classroom decor! 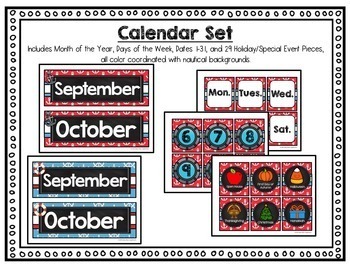 Click HERE to see the coordinating Nautical Editable Yearly Teacher's Binder.